Asian Art Scarves are available for volume buyers only. We don't sell to retail customers. 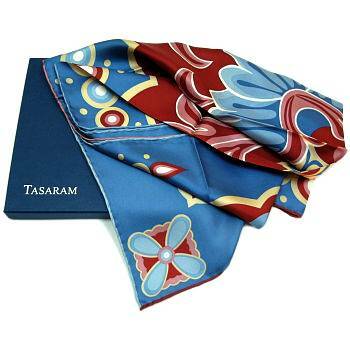 If you would like to buy Asian Art Scarves in quantity to use as gifts for corporate events or similar occasions please e-mail us at trade@tasaram.com. 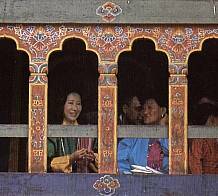 The elaborately painted houses of the Himalayan Kingdom of Bhutan are the inspiration behind the Himalaya Scarf. The exposed exterior timbers of these traditional wood-framed houses are meticulously decorated with bands of floral motifs and abstract designs. 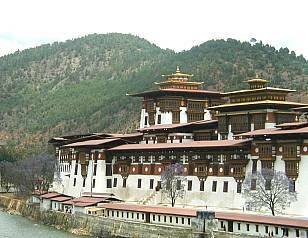 Bhutan is a devoutly Buddhist country, and every element of this decoration is a symbol, or at least derives from a symbol of Buddhist significance. In addition to beautifying the house, such adornments can be seen as a prayer or meditation expressed in color and line with intent to attract good fortune and ward off evil. Beams, cornices, doorways and particularly the rows of distinctive trefoil window frames are adorned with auspicious emblems such as the lotus and foliage and the sacred norbu jewel - the greatest of all gems revered for its wish-fulfilling potential. A flaming norbu amid a lotus flower forms the centrepiece of the Himalaya Scarf. Other favourite symbols are clouds, peony flowers and the dorji thunderbolt. The outlines of the designs are applied to the timber using stencils, then painted in using a variety of rich colors. 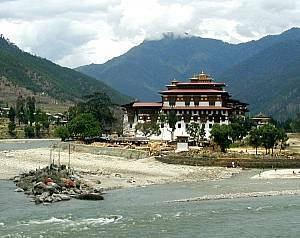 Traditionally the dyes and paints available in Bhutan consisted of just four natural pigments extracted from the soil: white, red-brown, orange-red and a very dark blue-black. By combining these four pigments the painter is able to achieve a wide range of colors and shades. 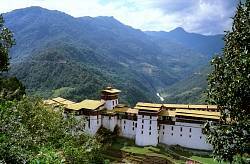 The overall effect is delightful and the houses lend an almost fairy tale quality to the green valleys of Bhutan.